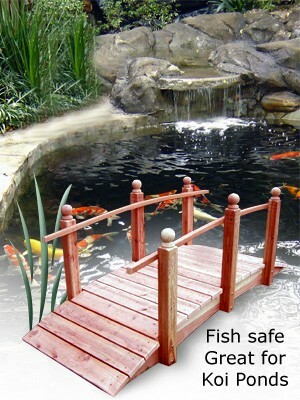 Navigate: StoreFront / Water Garden & Pond Products / Redwood Bridges - Hand Made, Many Sizes & Styles! Made by "Old World Craftsmen" 100% Redwood. All galvanized fittings, easy assembly, custom sizes, All Styles. 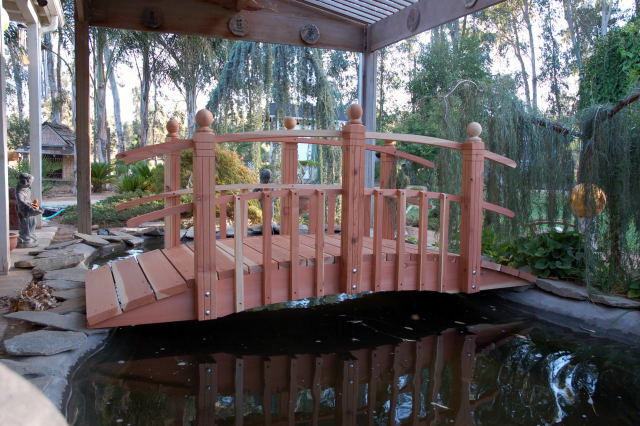 Our bridges are completely fish safe, we do not use pressure-treated wood in our construction which makes these redwood bridges perfect for Koi Ponds or any of your landscaping needs. No harmful chemicals or toxins! Custom Sizes available from 4 feet to 40 feet. Check our Quality and PRICES! We offer quick turn-around time. 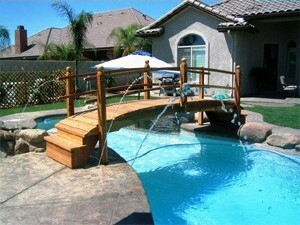 Once ordered, we will build your bridge and get it shipped to you in about 7 business days! We pre-assemble each and every bridge we build to insure it will go together properly when it arrives at your location with no problems! 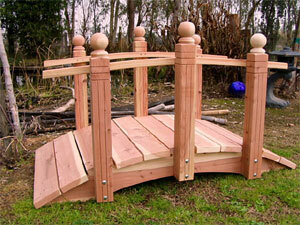 Our Redwood Garden Bridge sizes are quoted as span-size. Actual end-to-end lengths of each bridge will span the gap. For example a 6 foot bridge actually covers a 6 foot span. 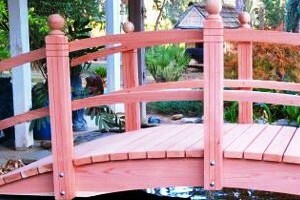 All of our Redwood Garden Bridges are shipped with a beautiful sanded natural redwood finish that will age with time. You can seal and protect the redwood with a sealer at any time to retain the redness and longevity of beauty. 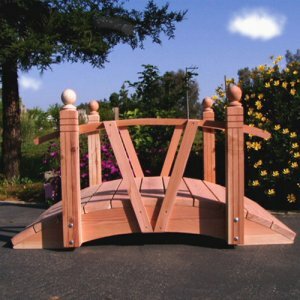 All of our Redwood Garden Bridges are very structurally sound, crafted with over 25 years of carpentry experience. They are also naturally termite & rot proof! 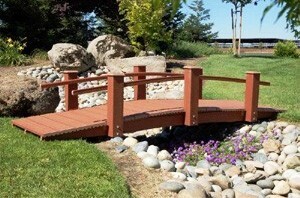 We offer several different styles of bridges to choose from. Please look at them and decide which would look best in your yard , ones with ropes, rails one or two, spindles, or no posts at all. 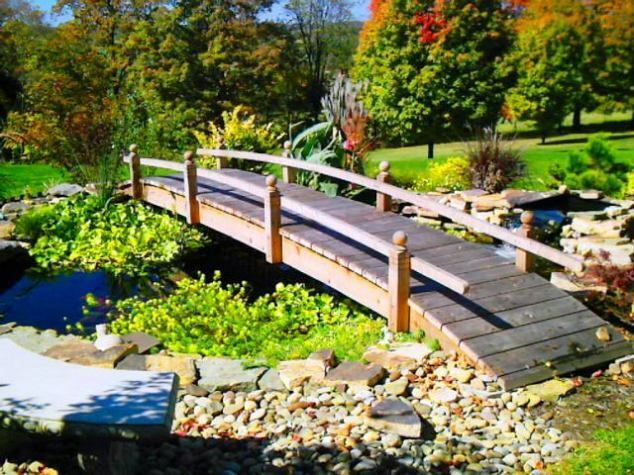 Need a bridge that is not one of our listed sizes, then we will custom build to your needs just for you to fit your pond, creek, or stream. We can build any size from 4 foot to 40 feet long and 2 feet to 20 feet wide. 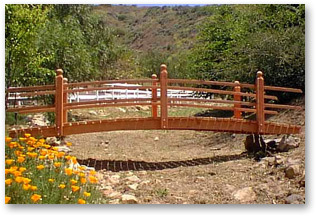 We are now pleased to introduce our own line of custom designed bridges, hand made with hand selected California Redwood. Please contact us at tjb@TJB-INC.com with your specifications and for more information and pricing on custom sizes. The listed shipping costs are for the Contiguous USA. If you are outside this area and would like to order one of these beautiful custom Redwood Garden Bridges, we will be happy to ship to you but please contact us for shipping quotes. All shipments over the USA border, require that customer pays any duty, import/export, or other taxes due upon delivery to the shipping company (FED-EX).